Michael Dunlop had a new engine flown in by private jet, and was up till gone 4am on the morning of the race fitting the engine. 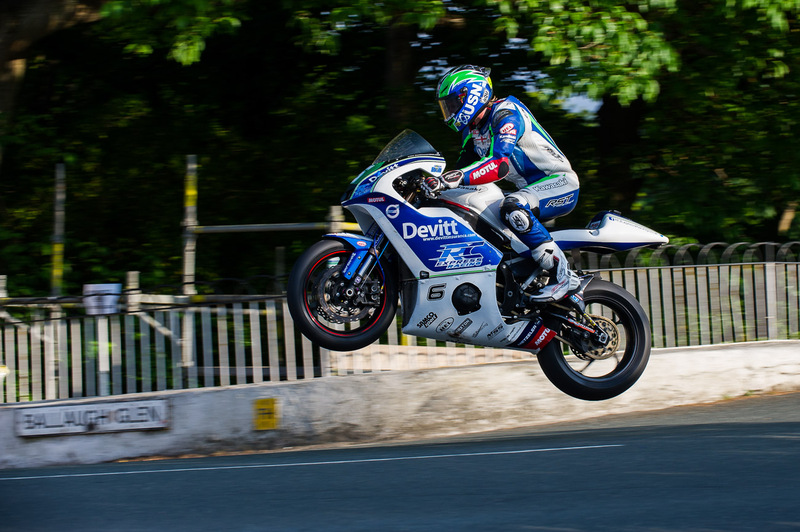 Ivan Lintin, the winner of the Lighweight TT, was spectacular over Ballaugh Bridge. 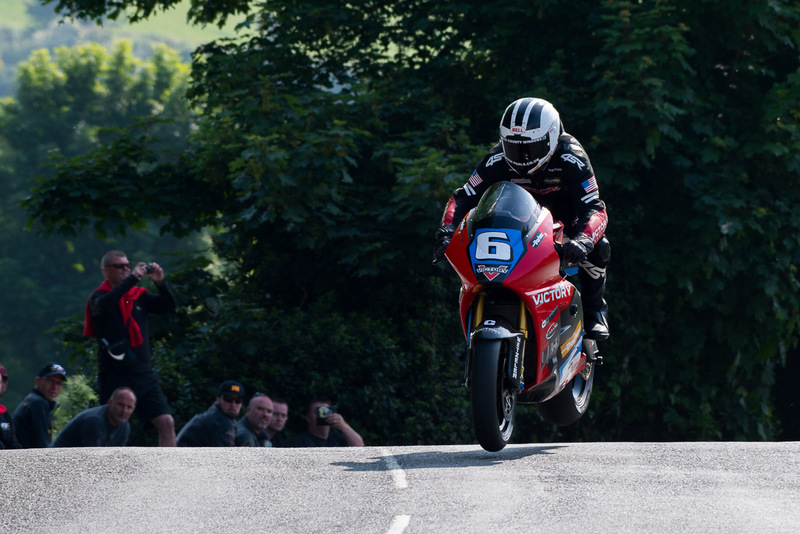 William Dunlop was 2nd in the TT Zero on the Victory. The weather is mercurial at the Isle of Man, and it often throws a spanner into the plans for the TT. This year, the weather has been perfect – hot and sunny throughout the practice week, and into the race week. That is of course, until Wednesday, when the fog and ocean mist delayed proceedings by several hours. This meant that the Monster Energy Supersport TT Race 2 got off to an afternoon start, rather than its planned morning get-off. Thankfully, the modest delay still allowed for a full-day’s racing, and good racing it was. 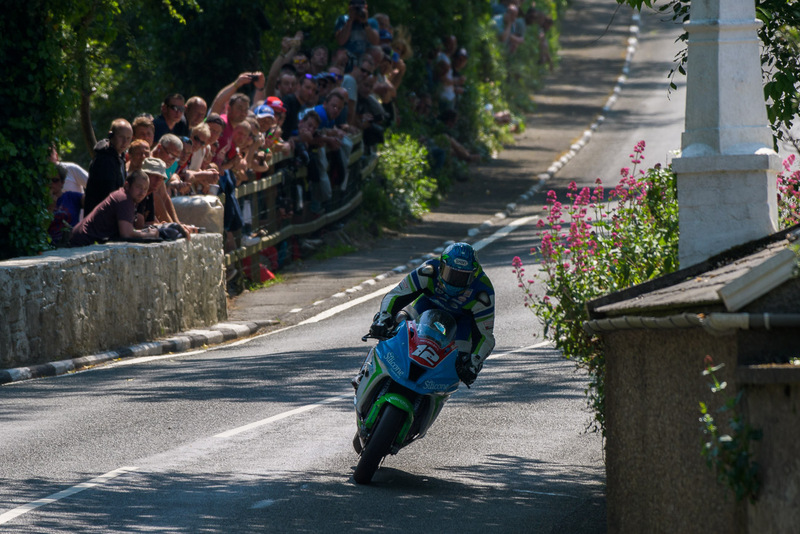 Ian Hutchinson at the bottom of Barregarrow on his way to winning the Supersport TT race 1. Monday was not a good day for Michael Dunlop. He was excluded from the Supersport results due to a technical infringement, and failed to finish the Superstock race. Dean Harrison finished on the podium in both races. With the big bikes getting the 2016 Isle of Man TT off to a wonderful start, Monday saw the Supersport and Superstock bikes on the Mountain Course for the racing action. Though the machines were different, the same names were the talk of the paddock. The weather was once again stellar for Race 1 of the Supersport TT, the first match of the 600cc class of machines, and all eyes on the TT course were getting record to see another race record drop. They would not be disappointed. We were treated to the best conditions of the 2015 Isle of Man TT for Wednesday’s racing. With that in mind, I decided to head for the hills and to Keppel Gate/Kate’s Cottage. Around three miles from the finish of the lap, Keppel Gate marks the point the riders start to descend from the mountain section. As I’ve already mentioned the conditions were great with very little wind and warm sunshine. With the perfect conditions came the photographers worse nightmare, heat haze. I will therefore use that excuse for any pictures that look a little soft. Above: The hard working volunteer marshalls at Kate’s Cottage, without them there would be no racing. 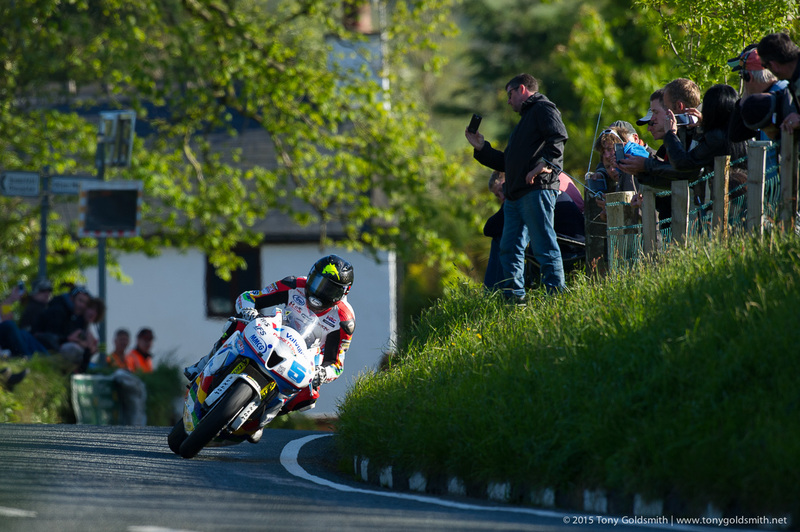 In addition to the TT Zero race, Wednesday at the 2015 Isle of Man TT played host to Race 2 of the Monster Energy Supersport TT. Despite the weather that had played havoc during the practice week, conditions for the second Supersport TT were perfect. As such, the fans were out in force to see who would grab the checkered flag. Bruce Anstey had shown himself capable of winning, taking the RST Superbike TT, and of course Ian Hutchinson has been the talk of the TT. Generally not a top pick in the supersport class, John McGuinness has been off his pace this year, though coming off the TT Zero win, he certainly seemed on point Wednesday. 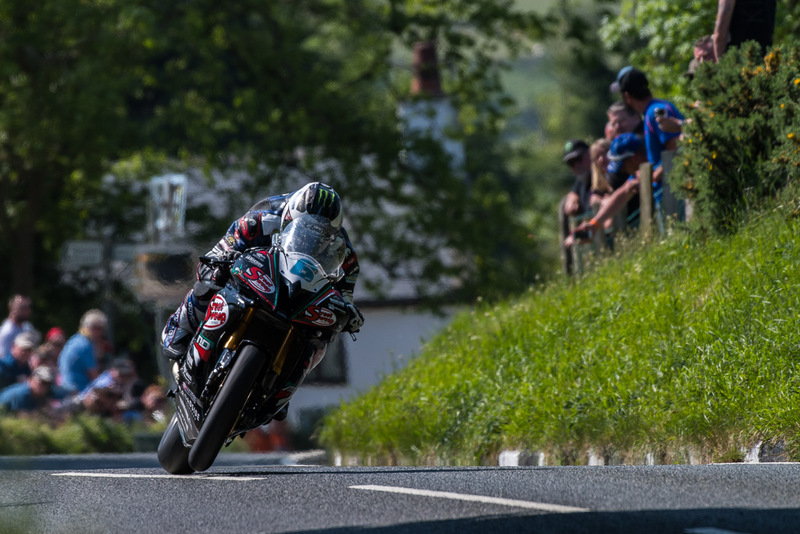 Reversing his decision to sit out the second supersport race, Michael Dunlop lined up on Glencrutchery Road, and certainly cannot be counted out of a solo-class race, especially one on a 600cc machine. 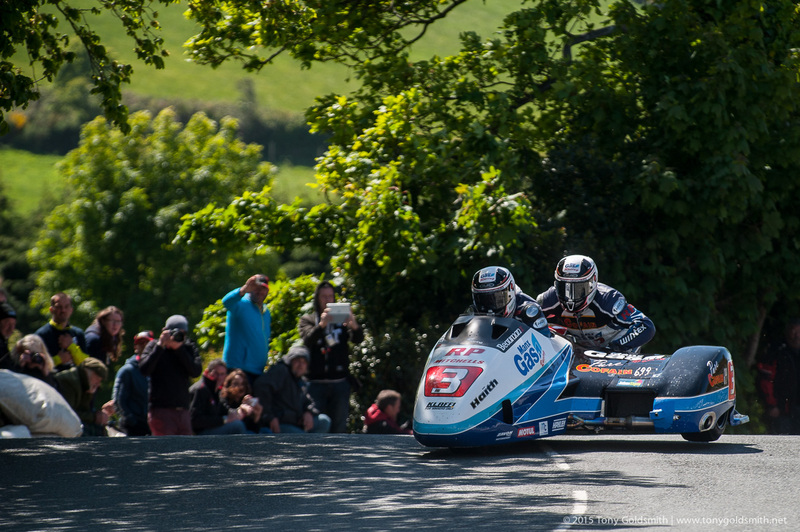 Monday saw again a schedule change to the 2015 Isle of Man TT, which meant that only the first Sidecar and first Supersport races would be underway, the Superstock race being pushed now to Tuesday. Conditions for the first Monster Energy Supersport TT race were perfect, though the 6:30pm start time meant that riders had to contend with the light, especially in the sections where it filtered through the tree leaves. That didn’t stop a great race from happening, though. For the last couple of years I had planned to go to the Glen Helen section, but it has never happened. This year I decided that I would finally get there, and that’s what I did for Wednesday’s racing. Glen Helen is a technical tree lined section and is home to the first commentary point for Radio TT. On dull days it can be pretty dark due to the trees, so a camera with good performance in low light is important. For these photos, I shot the Supersport race in the section just before the commentary point. I had planned to stay there for the sidecar race as well, and then move round the corner for the practice laps. Sadly the Manx weather had other ideas and there was no more action after the Supersport race. The Sidecar race was postponed until Today, so I will need to decide on a new shooting location. Aside from the motorbikes lapping at 120+ mph around the Snaefell Mountain Course during Race 2 of the Supersport TT, there was a fair bit of drama at the Isle of Man TT pit lane, especially when a race bike caught on fire. Coming in for his one pit stop, in between the second and third laps, Grant Wagstaff found himself subject to an unsuspected fireball, after a gas spill was ignited by his Yamaha R6’s hot exhaust pipes. A terrifying sight, thankfully the incident was taken care of quickly by the fire brigade and everyone else involved. The result was the pit lane being closed for about a minute, leaving the affected riders to have a time credit given to their official times. Last we heard, all involved will live to race another day, though Wagstaff was sent to Noble’s Hospital and treated for burns. Before heading up to the Bungalow for today’s races, the weather looked fairly promising with only cloud cover, and no ominous darker clouds threatening rain. Once I’d arrived it was a different story, with the low clouds covering the tram stop at the top of Snaefell – the island’s highest peak at over 2,000ft – threatening to roll down towards the circuit. Thankfully it held off long enough to complete the TT Zero and second Supersport races, but had enveloped the surrounding area before the second sidecar race and some practice sessions could run. The Bungalow is one of the highest points on the course, as the riders exit the Verandah and continue on their way towards Kate’s Cottage. If you watched last year’s TT highlights you’ll recognise it as the point where Michael Dunlop’s CBR600RR made a damn good attempt to throw him off, leaving rubber on the road and forcing him to take a much wider line through the corner than usual. Usually the backdrop to any image at the Bungalow is a lush, green hillside, but today it was mainly the low, rolling clouds. This makes the camera try to expose the whiteness of the clouds, leaving the bikes underexposed if you don’t work around it.